Gilpa Super Mix is an improved formula of the complete feeding stuff specifically formulated for sporting and working dogs. With 20% protein and 10% oils and fats, it is a medium energy, nutritionally balanced diet which is enhanced with fish oils and contains no artificial colours or flavours. This diet is rich in chicken with rice and contains New Zealand green-lipped muscle extract. Wheat, poultry (minimum 15% chicken), chicken fat, maize, fish oil (minimum 1.5%) vitamins and minerals, flaxseed (minimum 0.6%), potatoes and carrots (minimum 4% potatoes and carrots in the orange piece), rice (minimum 4% rice in the orange piece), yucca extract, mixed herbs (450 mg/kg), extract of New Zealand green-lipped mussel (50 mg/kg). 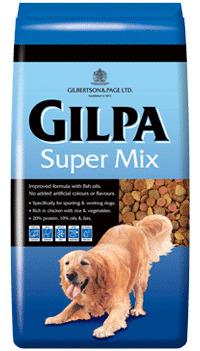 There are currently no questions for Gilpa Super Mix Dog Food - be the first to ask one!